The Weeping Woman is a leimenid Nereid that serves as the second boss of the Depths of Malatar. 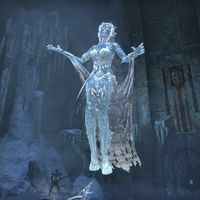 Found in a room in the Ruins of Garlas Malatar, surrounded by the ice statues of Aurorans and other victims, she seeks to take the Wrathstone back from you. She may summon Frost Atronachs awaken the Stone Watchers present in the room to aid her during the fight. An unnatural permafrost blocks the passage out of the room, which will only melt after she has been killed. Initially, the Weeping Woman is an Ayleid woman, lamenting the sacrifice of her people. She walks to the center of the room and shatters into chunks of ice, returning as a leimenid. "For her, we kept it hidden from our brethren and buried them with our tears. Here you too will drown." "My tears cling to everything, and drown it in my sorrow." "You won't take it. Not after all our sacrifice." "There is no choking down this bile!" "Share in our grief, forever." "Gloom hangs over us all." "Feel the weight of our loss!" "The guiding light burns everyone who reaches too closely." "Their sacrifice was not in vain." This page was last modified on 3 March 2019, at 20:42.